Monthly show turns angst into awesomeness. For most people, teenage diary entries are the stuff of deep embarrassment. For Scott Lifton, they're comic gold. As the producer of Berkeley's monthly Mortified show, he takes those awkward, wince-inducingly humiliating stories and spins them into something that's always entertaining and often hilarious, equal parts Schadenfreude and self-help group. 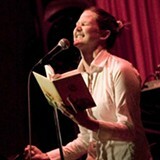 Founded in LA in the late-1990s, Mortified has since spread to nine cities in the United States and abroad, and spawned two books. Lifton started the San Francisco show in 2005 after attending some of the first few performances in LA, and about a year after that, brought it to Berkeley, first to the Starry Plough and then to the Shattuck Down Low (2208 Shattuck Ave., Berkeley). The idea, Lifton said, is simple: "everyday adults reading their actual pathetic, embarrassing teenage diaries," as well as poems, rap songs, stories, letters, and even screenings of the occasional home movie. The Berkeley show also boasts its very own eight-piece house funk band, The Freeze, whose three emcees improvise on-the-fly riffs on the pieces read, then lead their own set. As the show's producer, Lifton carefully curates the pieces and works with their authors — all volunteers — to edit for length, clarity, and cohesiveness. But by and large, Mortified's artifacts are honest and unvarnished. "The thing about Mortified is that people never thought this stuff would see the light of day," Lifton said. As such, they're imbued with the thrill that comes from knowing that this stuff — as unbelievably awkward as it is — actually happened. There was the kid who became so obsessed with Mötley Crüe that he invented an entire imaginary band, Live Evil, and wrote a catalog of songs in tribute; there was the girl who chronicled every teenage sexual exploit in a detailed spreadsheet that included a memorable quote, a picture, and a numerical rating for each conquest; there was the kid who filled a full five notebooks with odes to the guitarist of Def Leppard. There have been several suburban kids harboring gangsta rap dreams, more than a few teenage paeans to Eighties heartthrob Corey Haim, and countless other episodes of angst and embarrassment.